AmsOil Cummins diesel synthetic motor oil is available in all sizes from 1 quart to 55 gallon drums. First you determine if you need duramax diesel synthetic motor oil that is CJ-4 or not. You can select your duramax diesel synthetic motor oil using the table below or just click the online application guide link below. If you click the link just enter your year, then you choose the weight. For the CJ-4 specification there are two weights. Non-CJ-4 there are two weights. You can use CJ-4 in the 2007 and older diesels if you wish. The table below only contains oil recomendations for your duramax. There are also oil filter recomendations and bypass oil filter recomendations for the duramax. The on line application guide contains torques and capacities, and injen air intake systems for the duramax and a full line of products. It is worth the visit. 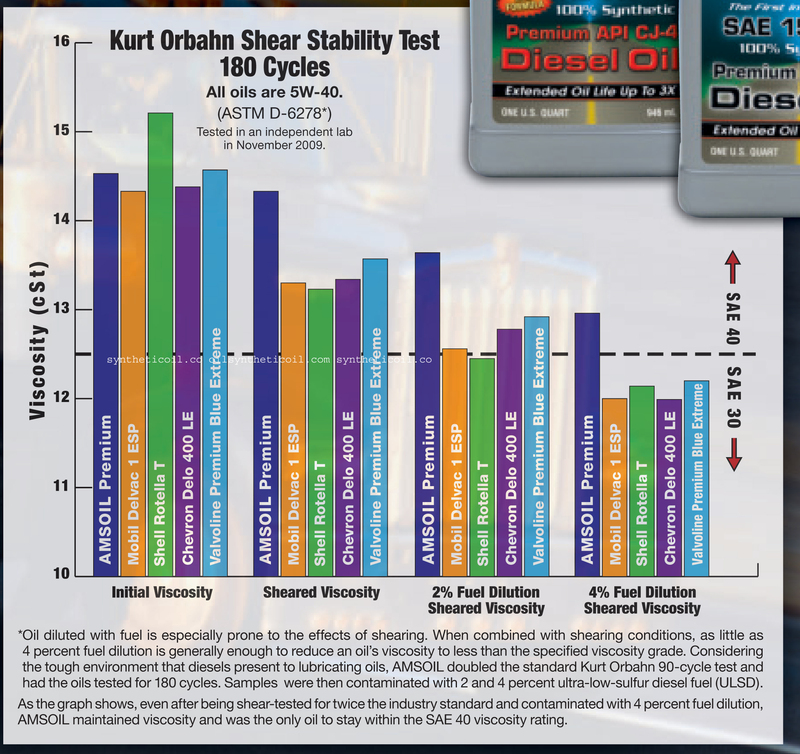 Please click to see a diesel oil comparions of using the Kurt Orbahn Shear stability Test. The diesel oil comparison compares amsoil DEO 5W40 Diesel oil and the DME 15W40 diesel oil vs Mobil Delvac 1 ESP, Shell Rotella T, Chevron Delo 400 LE, Valvoline Premium Blue Extreme. The diesel oil comparison test clearly shows that Mobil Delvac 1 ESP, Shell Rotella T, Chevron Delo 400 LE, Valvoline Premium Blue Extreme shear viscosity degrades quickly, The diesel oil comparison test further shows that at 2% fuel dilution shell rotella t falls out of grade, at 4% dilution Mobil Delvac 1 ESP, Shell Rotella T, Chevron Delo 400 LE, Valvoline Premium Blue Extreme fall out of grade. To find product for your Cummins now click to link to the application guide (filters and fluids capacities are listed also) just start with the year of your vehicle. There you can find capacities, toques, and all our products for your Engine , transmission and air filters. We carry a full line of product for the Duramax line. The easiest way to find it all is to click the online appication guide above. Below I have built a basic table for quick order of oil and filters.s If you have questions please call me (Santana ) call/txt 860 436 7034. If you know your product code ( the three letters )Click the price button next to it, then add to cart. Add prefered customer to cart and get instant savings of 25% -35%. All sizes are available quarts to 55 gallon drums, you can select the size once you go to the price page.. Local pickup is available at many US locations and several Canadian locations. You can call me for the location nearest to you. I would be glad to give you a quote over the phone or walk you through all the options.